WSU is favored by 14. The game will be on ESPNU at 7 on Saturday. Last edited by winwave on Sat Feb 09, 2019 11:53 pm, edited 1 time in total. 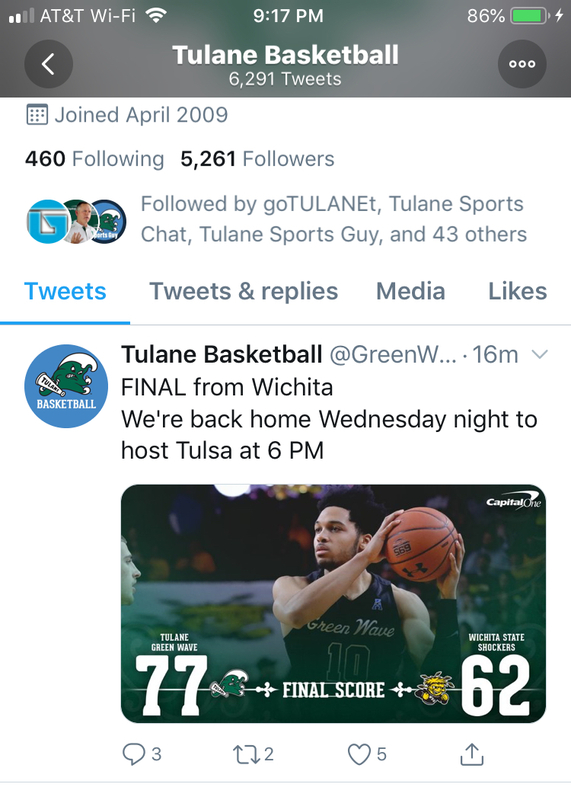 Oddsshark.com game prediction has Tulane covering, losing still by double digits 76-66. WSU has won 3 straight conference games against bottom half conference teams v SMU, ECU and Tulsa. For a minute I thought we won the game. Oh well. Does anyone think we'll win tonight? I certainly hope we play well and find a way to win, but I'm also ready to continue my binge watching of Game of Thrones at halftime if we have another stinker. Ok, at least we can say the players are not giving up on Coach Dunleavy. They're playing hard despite the results. I'd like to see more of Blake Paul if we are playing to win. Halftime and we're down 35-41. If you can’t win on the court fake it in the media. another notch in the Dunleavy coaching belt. After a fairly competitive first half, he draws up some killer halftime adjustments that result in one FG in the first 10 minutes of the 2nd half. Those impressive 5 points weren't enough to keep us close. However, I was excited to see the stat/graphic with the impressive list of all stars he coached in the NBA. I was worried I wouldn't see that one again. Dang, Magic Johnson! We've got ourself a coach! Swampnik, you only have to look to last year to see that if we had a PG we'd only average 13 TO. per game instead of the 15 we are averaging this year. Those 2 extra possessions would maybe result in at least 1 win. Maybe not. Just wait until you see a season or two with a point guard running this prolific offense before you come to any conclusions about our ability to compete in conference. Last edited by golfnut69 on Sun Feb 10, 2019 2:47 pm, edited 1 time in total. Some bright side news. The new NET ranking system caps a point differential at 10 for a win or loss. So getting blown out isn't hurting as as badly as it could. We move up 2 spots to 292 in the latest rankings by not even covering the double digit spread in our only game of the week.